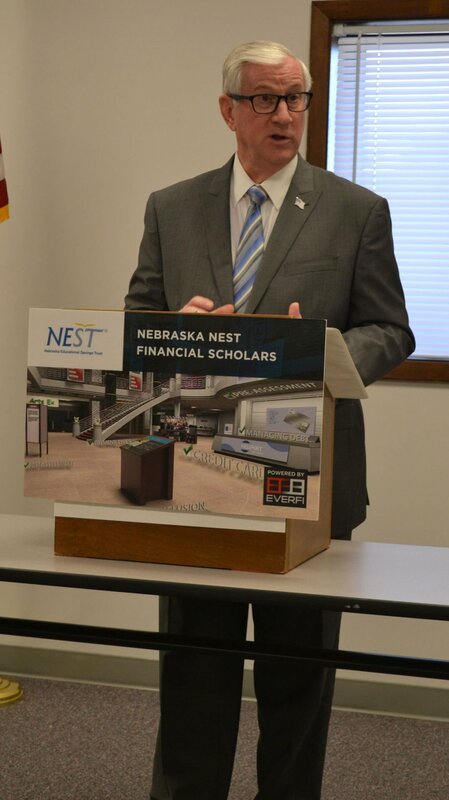 State Treasurer Don Stenberg addresses an audience about the results of the 2014-2015 NEST Financial Scholars online program Wednesday morning at Educational Service Unit 2. Jessica Feimer, senior schools manager for the Washington, D.C, education technology company EverFi, speaks to an audience with State Treasurer Don Stenberg Wednesday morning about the financial literacy software being used by schools around the state as part of the NEST Financial Scholars online program. High school students enrolled in the Nebraska NEST Financial Scholars online program made great strides toward improving their financial literacy during the 2014-2015 school year. The program, founded in 2013 by State Treasurer Don Stenberg, was created out of concern that high school students were graduating without a basic understanding of different financial situations. “As the chief financial officer of the state, and as a father and grandfather, I felt a responsibility to help improve the financial knowledge of our Nebraska high school students, and hopefully improve their financial skills heading into the future” Stenberg said Wednesday morning during a presentation at Educational Services Unit 2 in Fremont. The NEST Financial Scholars online program is sponsored by the Nebraska Educational Savings Trust, a division of the treasurer's office. Stenberg is trustee of NEST, the state’s 529 college savings program which has more than 230,000 accounts nationwide, include 69,000 in Nebraska, information in a press release says. The trust has more than $3.75 billion in assets. During the 2014-2015 school year, 101 Nebraska schools participated and 4,811 students were reached. The online program, developed by EverFi Inc. of Washington, D.C., features nine modules of instruction and takes around eight hours to complete. Nebraska students completed a total of 26,074 modules during last school year, and over the program's past two years, the total number of students reached is 7,025 and the total numbers of modules completed is 39,390. Most impressively, students recorded an average knowledge growth of 61 percent from the time they started the program to the time they completed it, Stenberg said. This was based off of a pre-assessment and post-assessment. “The results are in one word, outstanding,” Stenberg said. While NEST sponsors many schools around the state, in some communities, local banks sponsor the EverFi program, he said. Fremont is one of these communities. With sponsorship from First State Bank and Trust, students at both Fremont and Archbishop Bergan high schools received the educational tool. Local support is always important, Stenberg said, not only because it shows that the organization cares about the well-being of students in a community, but also because it shows what they have to offer from a financial standpoint. In addition to the overall 61 percent growth in financial literacy, Stenberg touched on a few key areas of improvement within the modules. In the subject area of renting vs. owning, Stenberg said that students’ average knowledge gain was 107 percent. Other subject areas that showed drastic improvement were financing higher education, 88 percent knowledge gain, and investing, an 81 percent knowledge gain. Stenberg believes that financial literacy must continue to be pushed into high school curriculum — it’s something that students will lean on their entire lives, he said. While recent efforts have been made to increase vocational education around the state, the same push needs to be made to heighten financial awareness, he said.